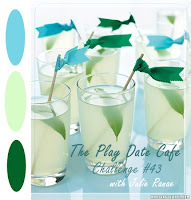 This week The Play Date Cafe has a refreshing summery photo with Turquoise, Green and Citrus to inspire you. We've also got a brand new sponsor! The PDCC welcomes Creative Inspirations Paint as this weeks sponsor! I just love these shimmery paints! Just open, shake and create! The winner of this weeks PDCC Challenge will get to choose 12 jars of paints courtesy of Creative Inspirations Paint! Click my photo to get a better view of the shimmer. Since I design for both the PDCC and Creative Inspirations Paint, I just happened to have the colors on hand to incorporate into this weeks PDCC challenge. Some other members of the Creative Inspirations Paint DT will also be playing along with this weeks PDCC challenge - more projects to inspire you! Creative Inspirations Paint's Design Team A was issued a "summer stroll" theme this week on their Blog, so it fits in well with the wonderful inspiration photo from the PDCC. The Boat image from ISC is stamped in Black Archival on White card stock, then colored with Creative Inspirations Paint. 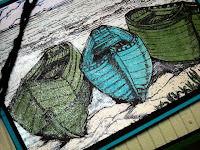 Staying with the color story, I used Emerald and Turquoise to color the boats, then added some Mellow Yellow, Blue Ice and Sea Foam to finish coloring the image. I used Sprout Bazzill Canvas for the Background, embossing with a Texture Fades Folder. To pull the image and panels together, I tied some square knots into some Black Hemp, then added some old Fishing Fly Line and a Fly that belonged to my grandfather. Here's this weeks Color Story Photo,we'd love for you to play along with this weeks challenge at The Play Date Cafe, you can find all the details here on how to enter. If you upload to any online gallery please use keyword PDCC#43 so we can find your creations! WOW! Fabulous colors for those wonderful wooden boats! 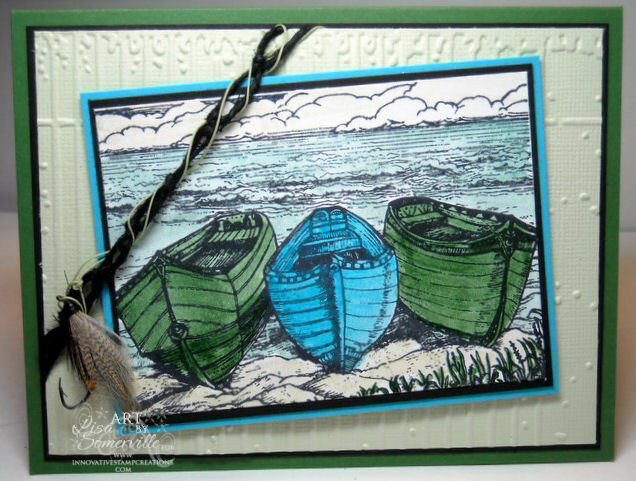 Love the shimmer on the boats and the beautiful painting you have created! Love the fly on the line too! Beautiful! 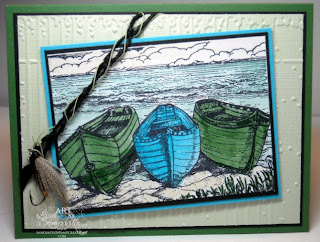 Beautiful card using the CI paints, colors are perfect for your scene! Beautiful colors for this weeks challenge. Love the little "extras" on your card. Wonderful! Love the water scene! Your boats are so awesome with that shimmer! Wow, I am so wanting to be near water today!!! Love this! beautiful scene using those paints. Going to be a challenging color combination. Fabulous, Lisa! Love the wonderful scene and the shimmer on the boats!! Beautiful card, love the colors and those paints look awesome. Your boats are beautiful and rustic but that ocean is awesome!!! Beautiful work. Great card Lisa! I love the way you've done the line. The colours work so well for your stamp too! Great shimmer! Great job Lisa! Love the shimmer on the boats! Beautiful card, Lisa! I love the nautical feel of it! I love the wood cut technique. This would make a great print! Love the effect of the water! Gorgeous colors and perfect for your summer scene! Thanks for the inspiration. Great sea scene! Love the way you embellished it! Love the card, especially the fish hook idea. Those boats sure look shimmery.